There are 7 reviews of Vétiver Moloko. This is a delightful, well-designed vetiver. It has a perfect balance between the dry, grassy vetiver and cypress notes and the softness of the milk and very slight sweetness of the vanilla. Normally I don't endorse vanilla, but it works very well here. In the early going, the creamy accord is almost like coconut milk, but that does not last long. The vetiver is very well done: earthy, grassy, root-like, with a slight smoky note in the dry-down. Wears well, has good longevity. A rare gem. The opening is wonderful. The vetiver is present from the beginning. I'm picking up olibanum as well, although it's not in the listed notes. This fragrance is well made and wears very comfortably. Excellent longevity and sillage, but not offensive to those around you. It draws people in. This would be an excellent addition to any wardrobe. I've tried two Ex Nihilo fragrances now, this one and Amber Sky. Both are ridiculously nice, but extremely expensive. At least you're getting a beautiful experience while wearing this, which is the whole point of wearing a fragrance. I want this, but I'll have to pony up some serious dough to get it. Two thumbs up as high as possible! HOT Damn!!! This is how you blend Vetiver!!! Who would have ever thought that vetiver and cream would be a winner(More milky than cream but you get my point). Definitely a change of pace as most vetiver scents have a fruit accord. 2 thumbs up! On my skin the vetiver is present from the beginning; a clean vetiver, quite bright with no significant earthiness or harsh sides. Combined with a somewhat underwhelming bergamot, it is quite a pleasant entry combination. In the drydown woodsy accords combines with a rise impression, which remains rather subdued jolds back too much to make a truly lasting impression. There is an agreeable but somewhat unexciting vanilla added towards the end, which is well executed nonetheless. I get, however, very little of the milky way promised in the name. The sillage is moderate, the projection very good and the longevity eight hours. Like so often, the top notes are the most convincing part of the development of this creation, and in this case nomen est omen indeed - this is a vetiver-centred spring scent, at least for them first half. The rest is somewhat inferior overall, but the pleasant albeit a bit standard vanilla as well as the solid quality of the ingredients sees it through to cross the line to a positive score - albeit just by the skin of its teeth. 3/5. Vetiver Moloko has a cooling, light green slightly sweet powder feeling that is relaxing and quite comforting to wear. A Moloko cocktail of sorts. Trying to compare this to my other vetiver fragrances is not helpful in understanding Moloko's appeal because it does not have the deep earthiness or rooty grassy aspects of many other great vetiver fragrances. However the green aspect is strong and clear with vetiver plus a dry cypress green note. It is this green dry quality that is strengthened by amyris and the sandalwood sweetness of amyris is further civilized by vanilla in the base. Vetiver Moloko has some sweetness, yes but this is balanced by dry woods and a piercing cold green quality. This one is not a typical vetiver scent but is an all new sensory mix for vetiver. Moloko is a very fine green relaxing perfume that has a calming narcotic deeply felt greenness. Excellent! 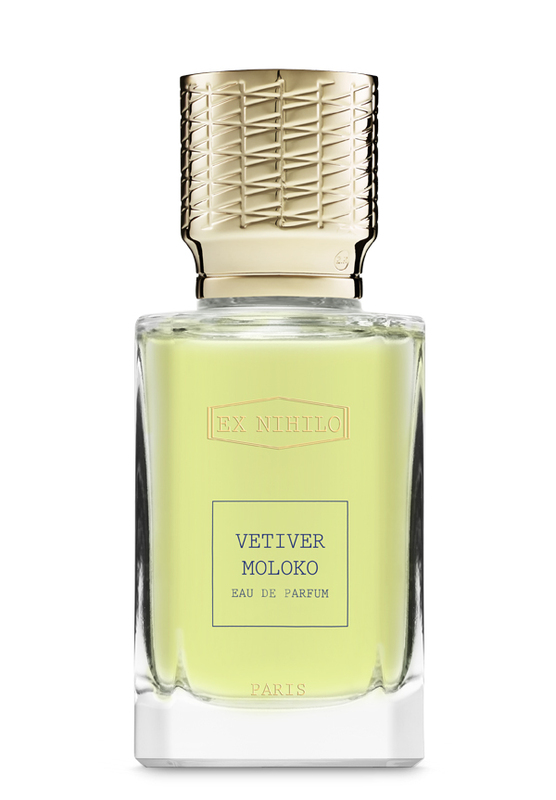 Vetiver Moloko is a perfectly balanced yet quite bracing (at least in its top and the core) take on a "vetiver-fir resins founded" main accord from the luxuriant parisian maison Ex Nihilo. Really well made accord and a quite masculine elegant fragrance: This juice could enter, with a broader outlook (and in a more specifically piquant/herbal acception), in the same "clan" as several spicy-aromatic more or less known juices (being something waving between the Cartier Declaration/Frapin L'Humaniste's "liquid" spiciness, the Terre d'Hermes/Rouge Bunny Rouge Tundra/7de Loewe/Clive Christian's earthy-dusty spiciness and the DsQuared2 He Wood's metallic mountainous woodiness)...but in here the combination (over the initial fresh liquid-hesperidic freshness from the forest) is finally smoother, soft, delightful and kind of silky-leathery. Opening is vaguely rosey, aromatic (rosemary, oregano? ), hesperidic, spicy-fluidy (cardamom), dusty and woodsy by cypress-resins, aromatic vetiver and pungent-woody amyris. The latter exudes a powerfully woody aroma which in this case is rendered finally smooth, subtle and refined but at the end of the run really straightforward in woodiness vaguely pencil-shavings a la Montana Graphite. Vetiver is here (salty-hesperidic, sharp and angular a la Encre Noir) emerging in the second part of development in all its sharp saltiness but the main woody vibe is in here provided by the standout note of herbal-woody amyris. Finally vanillic-milky notes provide a soft basement soothening the dominant herbal-spicy-aqueous woodiness. Vetiver Moloko is not properly original but is surely an extremely refined, solid and distinguished take on salty-herbal woodiness exuding a sense of fresh urban-minimalistic elegance and modern "in neo-classic sense" style. The final wave projects a fresh twist of exoticism teleporting us in a far caribbean windy-salty atmosphere. Good longevity and quite "fragrant/realistic/invigorating" perception on my skin. There are no member images of Vétiver Moloko yet. Why not be the first?